Step 1. Pick the fabric of your choice! This can be the most fun part, especially since you can have a different fabric on each side like I did. 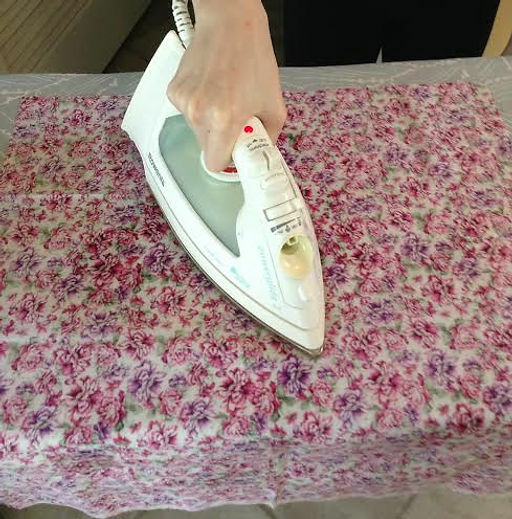 Then, iron the fabric on the opposite side. This protects the colors and designs on the right side of the fabric. Step 2. It’s time to measure! As a rule of thumb, always measure twice and cut once! Measure very carefully, and always add a 5/8 inch seam allowance. 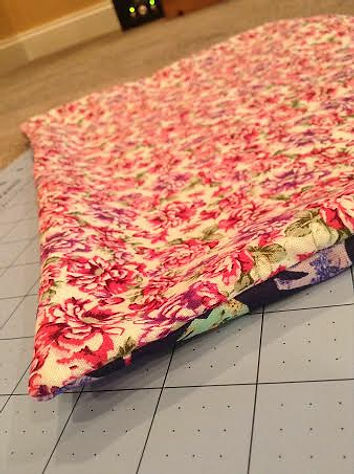 This allows room for the seams without cutting in on the actual size of the pillow. 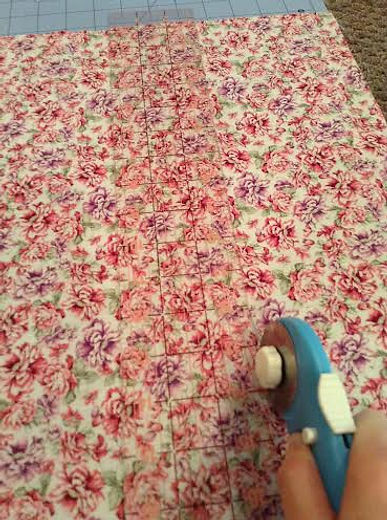 I like to use an 18-inch quilting ruler and mark the measurements using a chalk pencil on the wrong side of the fabric. Step 3. 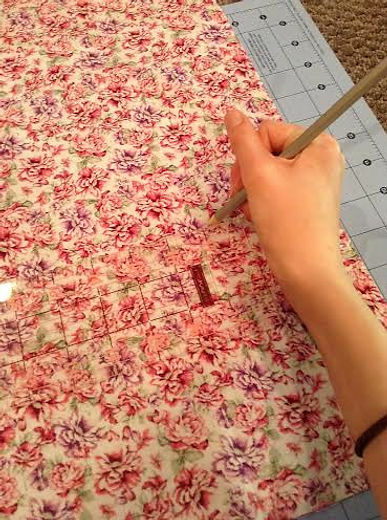 Once you’ve carefully measured, cut the fabric using either scissors or a rotary cutter. I definitely prefer a rotary cutter because it is much faster and usually makes straighter edges. When using a rotary cutter, be sure to cut on a cutting mat like the blue one you can see below! Step 4. Now you have your two pieces of fabric, one for the front, and one for the back of the pillow! Line them up and make sure they are the same size. Step 5. 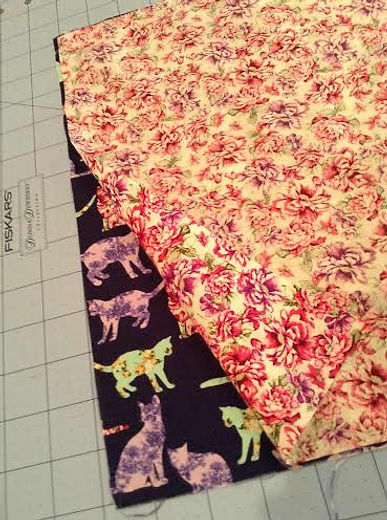 Once the fabric pieces are lined up, it’s time to pin. But I cannot emphasize this enough, pin them together with the right sides together. Let me say that again. 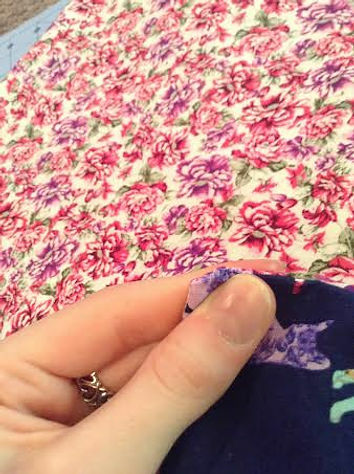 Pin them together with the right sides together, because you have to turn the fabric inside out once you sew the pieces together. Step 6. Since you need to stuff the pillow insert into the cover, you have to leave an open space. Depending on the pillow size, I usually leave between a 6 and 8-inch opening. 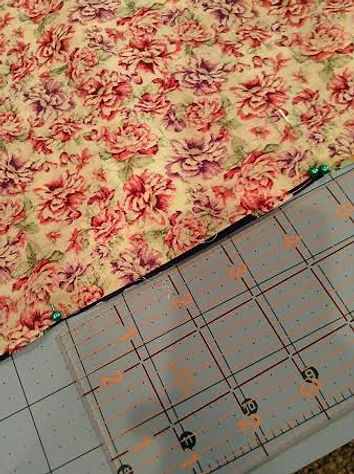 Find the center on the fabric and measure out equally from there. And for this opening, put it on the bottom of the fabric pattern (if there is a top and bottom). This is because there will be a visible hand-sewn theme that you want to be able to hide! Step 7. Finally, time to sew! 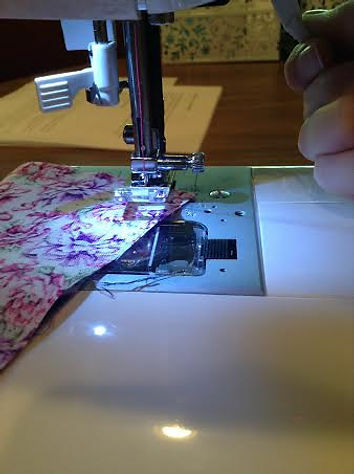 Get your machine ready, and make sure to match the bobbin and top thread to the fabric. This is when having a automatic threading machine really comes in handy! Step 8. 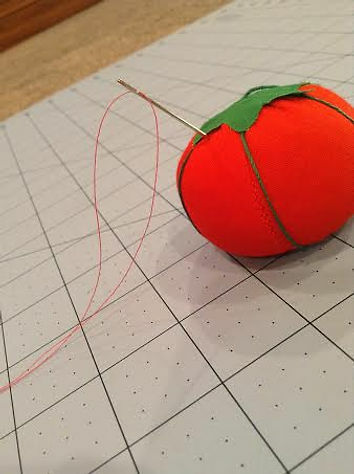 Start sewing, and make sure to tie up the start and finish of the thread. 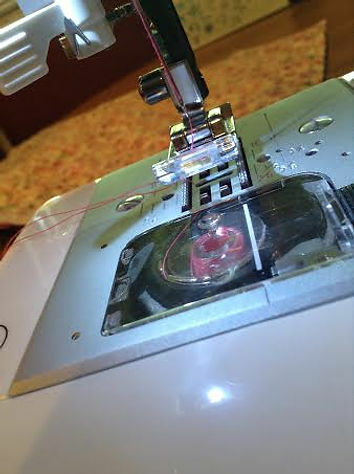 You can do this by either manually tying a knot or back-stitching on your machine. I would recommend using a medium stitch length, but definitely do not just base! Trust me, I have tried this before, and it does not work! Step 9. Turn the pillow cover inside out and carefully stuff the pillow insert inside. Be really careful not to rip the stitches! Step 10. The edges of the cover might look a little rounded, so here’s what you can do. 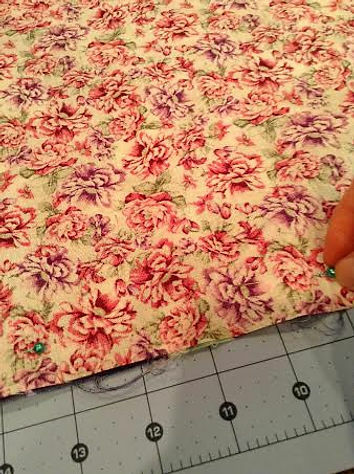 Take the corners and pinch them back and forth until you work the bunched up fabric out. Step 11. Now we need to close the opening by hand sewing. 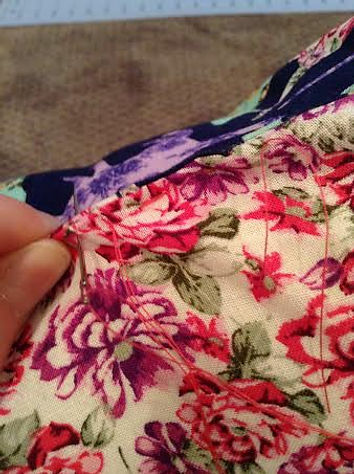 Use a matching thread and make sure that you have enough thread on the needle to cover the entire opening. Step 12. Hand-sew the entire opening, pinning first if needed. 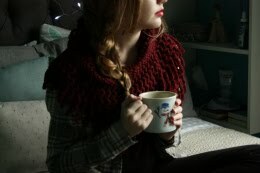 Be sure to slightly overlap the already machine sewn part with hand stitches so that the stitches never come unraveled. And now you’re done! 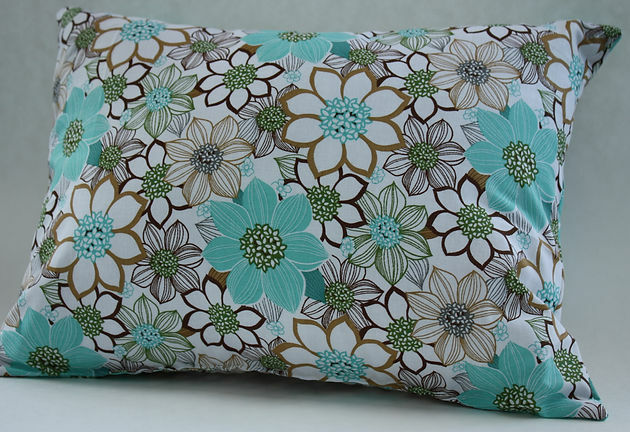 It’s simple, fast, and a much more cost-effective alternative to buying pillows.